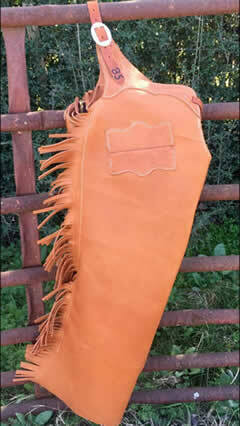 All of our Chinks, Leggings, & Chaps are made from the finest leather available. 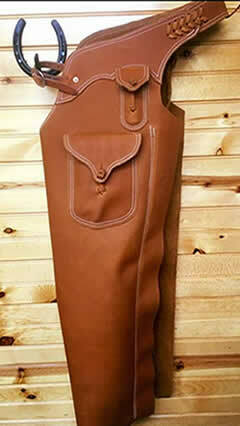 From heavy oil tan to glove tan we have leather available in every finish and color you can imagine. 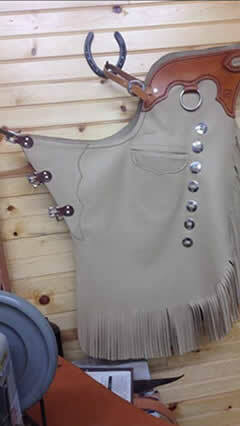 We only use brass or stainless hardware unless custom conchos and buckles are requested. 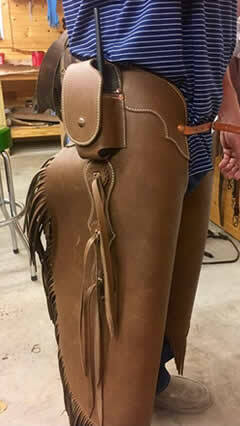 Each pair is custom made to fit the customer just right. We can make them as plain or as flashy as you like. Includes 1 pocket on the side of your choice, a ⅝” skirting leather belt in the front and a 1” skirting leather belt in the back. SHOTGUN CHAPS go all the way to the ground. They’re heavier, warmer and keep you dry in wet weather. CHINKS are shorter than CHAPS and cover your knees, but don’t go all the way to the ground. Since they’re shorter they’re also cooler and weigh less.